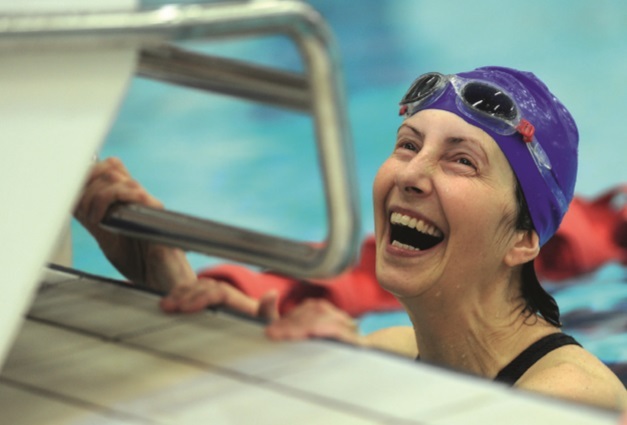 With more sports and leisure opportunities on offer than ever before, swimming remains the country’s most popular participatory exercise activity. Latest ﬁgures from Sport England revealed a small increase of 11,000 people taking up the sport in 2016 with 2.52 million now swimming at least once a week. Yet the number of public swimming pools in the country continues to decline. In fact, the 2017 State of the UK Swimming Industry Report by Leisure DB reveals that the number of swimming pool sites has dropped by 0.5 per cent in the last 12 months. For the ﬁfth year in a row, more swimming pool sites have closed than opened. “Despite another slight decline in overall swimming pool numbers, technology and water that have previously caused a few issues for innovators are ﬁ nally beginning to come together,” comments David Minton, Director of Industry Analysts at Leisure DB. “New ideas and products to encourage swimming participation are emerging and it will be interesting to see how these developments impact the UK swimming pool market over the next 12 months.” In Wales, 17 public pools have closed since 2004 and only eight have opened or been refurbished, telling us that facilities in Wales are fewer than in the past. “Public swimming pools in Wales are predominately owned by the 22 local authorities in four regions and there are geographical challenges, namely accessibility, to quality facilities in places like North or West Wales. So it’s not necessarily about the number of pools it’s how we get the communities to engage and use the facilities we have,” explains Fergus Feeney, CEO of Swim Wales. “Having said all of that, you can never have too many pools,” he adds. Meanwhile in Scotland, there are 277 public swimming pools currently listed in Sport Scotland’s latest figures – a number which has slightly increased in the last eight years. There have been a number of stand-out new facilities open in recent years including the Aberdeen Sports Village, Olympia in Dundee, the refurbishment of the Royal Commonwealth Pool in Edinburgh and the extension of Tollcross Glasgow. “The public swimming provision in Scotland remains relatively good,” comments Forbes Dunlop, Chief Executive of Scottish Swimming. “Scotland has been fortunate to have some excellent new facilities open in the last ten years, these include national, regional and local level facilities.” However, Forbes believes that there are still some gaps in the provision, which include a network of regional standard competition and training pools, national standard diving facilities in the West of Scotland and further provision of deep water pools for diving and synchronised swimming.